Starting anything new can be overwhelming at first and giveaways are no exception. There’s no magic formula for a perfect giveaway, though there a few key things to focus on when setting up your first giveaway to ensure you get the most out things from the start. We’ve put together a few quick and simple tips to keep in mind to set you on the right track. I don’t blame you. It’s almost impossible to resist jumping in and putting your first giveaway together. However, the first step to launching a successful giveaway is to sit back, relax (maybe throw on some Enya), and set out tangible and measurable goals for your giveaway. In the past, we’ve seen many successful giveaways run with different goals in mind. We’ve put together case studies that highlight users whose goals range from engaging their social followers, to growing their mailing list, even launching products. The goals you set out will affect every subsequent step of the giveaway planning process. Make sure you spend as much time as necessary on setting the goals of your promotion. If you need some inspiration, check out an article we wrote discussing 8 benefits of running a giveaway. How long will my giveaway run? We’ve seen giveaways run for a week, some for a month, and a few even longer than that. The length of your giveaway is completely up to you and your goals. 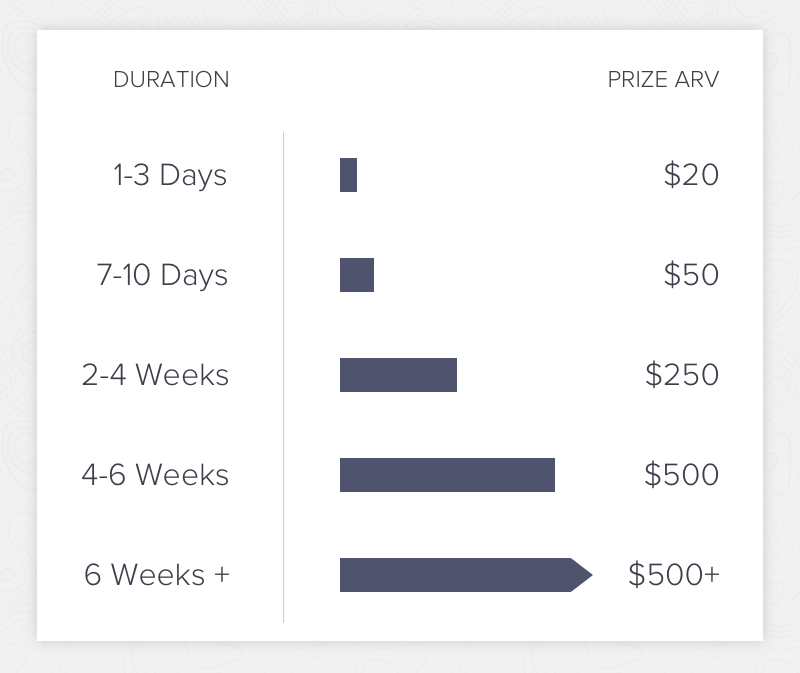 Here’s an article we’ve put together to help you determine the length of your giveaway based on the value of your prize. What prize will I giveaway? Determining your prize is one of the most important aspects of your giveaway. You want to make sure you giveaway something that can be experienced by folks of all ages and interests but also something that helps promote your brand. When we run our own giveaways, we’ll put together a prize pack with an Amazon gift card, a t-shirt and some other swag, and a free Rafflecopter subscription. If the winner isn’t ready to run a giveaway, they can still enjoy the gift card and t-shirt. It’s a strategy that helps fuel engagement in your giveaway. A win-win! Most of the successful giveaways we’ve seen run have prizes that are relevant to their goals. As you set up your next giveaway,when you’re considering your prize, think about the kind of entrants you’ll attract with your prize. How does this giveaway fit into my monthly marketing agenda? It’s always good to plan. Even though you haven’t run your giveaway yet, it’s important to consider how giveaways will be integrated into your monthly marketing and content strategy. It will likely help you plan this giveaway more effectively. New followers you attract will likely want to participate in subsequent giveaways, and frequent giveaways are always a perfect way to grow and engage your user base. Pre-launch. 48 hours before your giveaway starts. Launch. 48 hours after you giveaway starts. During the promotion. Post-launch but before the giveaway’s ending. Ending. 48 hours before your giveaway ends. We have some awesome advice in our Field Manual to help you get started. We’re almost there! Now that you have goals, a structure, and a promotion schedule, let’s setup the giveaway. If you’re not yet familiar with Rafflecopter, you can become an expert in about 3 minutes by checking out these videos. It’s important to keep your goals in mind when deciding how you want your entrants to participate. For example, if your goal is to grow your email list, it would be a good idea to leverage our ‘automatic email list subscribe’ entry option. Moreover, if you’re looking to grow and engage folks on your social channels, we’d recommend paying special attention to our Facebook, Twitter, and Pinterest entry options. The key to setting up an effective giveaway is to keep things simple and goal-oriented. You don’t want to overwhelm your entrants with too many entry options. We generally recommend adding around three to four. And don’t forget, the simpler the task, the easier it is for entrants to complete which results in a higher engagement rate of your giveaway. If you’ve followed these above steps while putting your giveaway together, you’re off to a great start. However, everyone’s prospects and customers respond differently to different types of promotions. The only way to see what works best for you and your followers is to test things out. Maybe your entrants will engage more with frequent giveaways rather than ones with extended lengths. Additionally, entrants might prefer multiple prizes with a lower ARV (Approximate Retail Value) as opposed to a single, more expensive prize. The only way to find out these answers is to test them out in your next giveaway. Enter our flash giveaway! Run or entered giveaways before? What do you think makes a giveaway successful? Comment on this embedded Facebook post below with your *best* tip for those giveaway admins just getting started and you’ll be entered for a chance to win some Rafflecopter swag (giveaway terms and conditions listed here). Good luck! I think getting the word out is the most important. Share, share, share. On social media, groups, word of mouth. Tell everyone! The more people that sign up- the better your giveaway! Post giveaway on all social media groups (ie: facebbook, instagram, twitter, goggle+, etc.) and ask them to share w/ friends, tag friends. The more buzz you have around the giveaway the more people will participate. Good luck! Easy entry is always the best. Also, post giveaway on all social media groups (ie: facebook, instagram, twitter, goggle+, etc.) and ask them to share w/ friends, tag friends. The more buzz you have around the giveaway the more people will participate. Good luck! Very true. The easier the means of entry, the higher the engagement! Setting up a promotion schedule seems like a really good idea. That way if you have a good plan a lot of people will see it. Promoting your giveaway on social media everyday definitely helps my giveaways be successful. I also remind people about the giveaway at the end of each blog post during the giveaway period. I really like the idea of promoting the giveaway at end of each blog post during the promotion. Great idea. Thanks for sharing, Sierra! selling raffle tickets and visiting personally with flyer and verbally say. Price range within means of average persons means too..
Lots more but it worked hoped yours does too. Make the giveaway easy to enter otherwise contestants will be turned off. Completely agree Sara — A simple entry method is one of the best ways to maximize participation. There are some good Reddit and Google+ Groups to promote giveaways, usually see a bunch of entries after posting…https://www.reddit.com/r/Sweepstake. I find these do even better then actual giveaway sites.